In the violent region formerly known as the US-Mexico border, the survivors will be brought together to face what they fear and fear what they become. 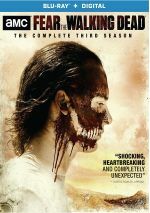 A prequel of sorts for the highly successful Walking Dead, Fear the Walking Dead returns for Year Three. 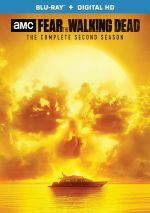 This “Complete Third Season” set contains all 16 episodes of Fear. The plot synopses come from the series’ official website. Although Season Two took a while to get into gear, “Eye” launches S3 with a pretty solid bang. It immediately puts our main family in peril and throws out enough violent action to make it a good launch to the year. The heightened action of “Eye” continues with “Frontier”, as its opening portrays the apparent death of a major character. I say “apparent” because with a series like this, you never know – and I’ll not feel surprised if the aforementioned character returns someday. Whatever happens in the future, “Frontier” offers a taut show. After a couple of fairly action-oriented shows, “TEOTWAKWI” puts an emphasis on character development. While this means it lacks the visceral impact of its predecessors, it still manages to move along events in a satisfactory manner. The last episode concluded with the return of a long-gone character, and “100” focuses on his saga. It does so in splendid fashion and becomes easily the best episode of S3 – and one of the strongest segments of Fear period. After the grand drama of “100”, “Flame” can’t hope to compete, and it doesn’t. Nonetheless, it does fine in its own right, as the episode thickens relevant plot components. Like “Flame”, “Dirt” exists mainly to advance various narrative moments. Like "Flame”, it accomplishes these goals, though it feels a bit stagnant. Hopefully subsequent shows will get into more of a groove. If nothing else, “Unveiling” gets praise because Travis finally cuts his hair – I tired of his mangy mane a lot time ago. That’s the highlight of this lackluster episode, as its “cowboys and Indians” vibe doesn’t do a lot for me – not until its fairly intriguing ending, at least. Just as “100” gave us backstory for one member of the Salazar clan, “Wrath” does the same for another – but only briefly, as most of the show concentrates on the Clark family as usual. Unlike the last few episodes, though, “Wrath” branches out beyond Madison and her kids, a factor that brings S3 much needed life. Man, I can’t wait until the series leaves the stupid ranch! These elements play up character drama, a facet that could work – but just doesn’t, as I don’t much care about the interactions among the different factions. Here’s hoping S3 changes location and approach soon. I can live with S3’s ham-fisted racial politics if the shows offer reasonable excitement. Unfortunately, “Diviner” continues a sluggish trend of episodes that gets a minor boost from a visit to a bazaar but otherwise remains mediocre. When did Fear stop being a show about zombies and turn into a series about disputes over water? Some action adds life to “Serpiente” but the overall dullness over the aquatic theme makes it less than engaging as a whole. Much of “Keeper” sticks with the usual tired melodrama at the ranch. However, the arrival of a massive zombie onslaught enlivens the proceedings and gives the episode more kick than usual. Let’s hope the remaining one-fourth of S3 continues along this upward trend. While I felt optimistic the momentum of “Keeper” would continue here, that only partly becomes true. We do get some major developments, but we also find ourselves stuck with a lot of the usual melodrama. “Land” ends up as a spotty show due to the lack of balance. Though it focuses largely on character elements, “Matadero” works better than its predecessors, perhaps because it finally leaves the stupid ranch in its rear view. We get a good mix of intriguing developments in this mostly involving program. With little time left in S3, “Bad” manages to heat up the drama to a reasonable degree. I can’t claim it gets me excited for the season finale – not after that long dry stretch of episodes – but at least it pushes matters in the right direction. After a trying season, “Ride” ends matters with more frustration. While the episode comes with some big action, it wastes too much time on an ineffective fantasy sequence and draws to a maddeningly vague close. Of course, I don’t expect S3 to wrap with a tidy bow – not with S4 on the way – but I anticipated a more formal “season finale” than this. “Ride” finishes S3 on a semi-sour note. Fear the Walking Dead appears in an aspect ratio of approximately 1.78:1 on this Blu-ray Disc. Expect solid visuals here. Sharpness largely worked fine. A few darker shots could seem a smidgen soft, but the majority of the episodes delivered tight, concise materual. I noticed no jaggies or shimmering, and I witnessed no edge haloes. Source flaws created no distractions. In terms of palette, Fear went with a pretty standard orange and teal. Those hues came across well enough given their limitations. Blacks seemed dark and tight, while low-light shots offered nice delineation despite the occasionally soft interior element. A bit sharper than prior years, S3 looked good. As for the series’ Dolby TrueHD 5.1 soundtrack, it worked reasonably well. The soundscape opened up the material in a decent manner, though the mix never became terribly involving. Still, various elements fleshed out the spectrum, and a few – such as aircraft and other vehicles – featured the surrounds in a pleasing way. Audio quality satisfied. Speech was distinctive and concise, without edginess or other issues. Music appeared lively and full, while effects showed nice clarity and accuracy. The track wasn’t as good as one would get from a theatrical release, but for a TV series, it seemed positive. “Eye of the Beholder”: co-creator/writer/executive producer Dave Erickson, co-executive producer/director Andrew Bernstein and actor Kim Dickens. We get a smattering of mediocre notes about cast, characters, story and performances, but mostly we hear how “amazing” everything is in this dull commentary. “Children of Wrath”: Erickson. Bernstein, Dickens, writer Jami O’Brien and actor Dayton Callie. While more spirited and less packed with praise, the “Wrath” chat still doesn’t work terribly well. We get a few minor tidbits but not much to make this a useful discussion. “Sleigh Ride”: Erickson, Dickens, Bernstein and actor Colman Domingo. The “Ride” commentary resembles that of “Wrath”, so expect occasional nuggets of substance mixed with joking. It’s probably the best of the three chats, but that doesn’t say much, so don’t anticipate much useful material. Disc One opens with ads for Into the Badlands Season Two and The Walking Dead Season Seven. On Disc Four, we get Deleted and Extended Scenes for eight episodes. We locate clips for “Eye of the Beholder” (one scene, 3:07), “The New Frontier” (2, 2:37). “TEOTWAKWI” (2, 2:46), “100” (2, 1:48), “Burning in Water, Drowning in Flame” (1, 0:45), “The Unveiling” (1, 1:06), “La Serpiente” (1, 0:36), “This Land Is Your Land” (2, 2:05) and “El Matadero” (1, 0:50). Should you expect much substance from these clips? Nope. They add some minor character tidbits but nothing more, so they seem pretty forgettable. After two good years, Fear the Walking Dead fizzles somewhat during Season Three. Though we get a few good episodes – and one great one – too much of S3 feels dull and without great momentum. The Blu-rays offer very good picture and audio along with insubstantial supplements. S3 of Fear offers some highlights but the overall package disappoints.